If you are the one in your household with the job of buying the Christmas turkey, do you know what the labels really mean and which is best? The Traditional Farmfresh Turkey Association's tips for choosing & cooking your Christmas turkey. One factor which can make all the difference to the flavour and texture of a turkey is whether or not it has been dry plucked and matured. This method of production is known as traditional farm fresh. Also, ask your butcher how old the turkey is. The majority of birds are slaughtered as ‘teenagers’ (about 8-12 weeks), having been grown very quickly and cheaply. As a result, the flesh is effectively ’stretched’ and has no fat cover, resulting in meat that is often dry and coarse. The Traditional Farmfresh Turkey Association turkeys are reared for 2-3 times longer, to full adult maturity in a natural environment, and are never given additives for growth promotion. What is the Golden Turkey® Quality Assurance Guarantee? We are proud to be a part of around 40 like-minded farmers who are passionate about producing the ultimate Christmas turkey in terms of eating quality, welfare standards and environmental responsibility. The Golden Turkey® Quality Assurance Guarantee mark represents an accreditation which is only applied to birds meeting all aspects of the code of quality requirements. Golden Turkeys® are produced solely on selected farms and naturally reared on a quality cereal-based diet. Our turkeys are grown to full maturity and to the highest welfare standards, dry plucked and game hung for at least seven days, according to tradition. Our traditional method of production has been recognised by the EU as qualifying for the Award of Traditional Speciality Guarantee. This is recognition that our accredited Golden Turkeys® really do have a special quality. 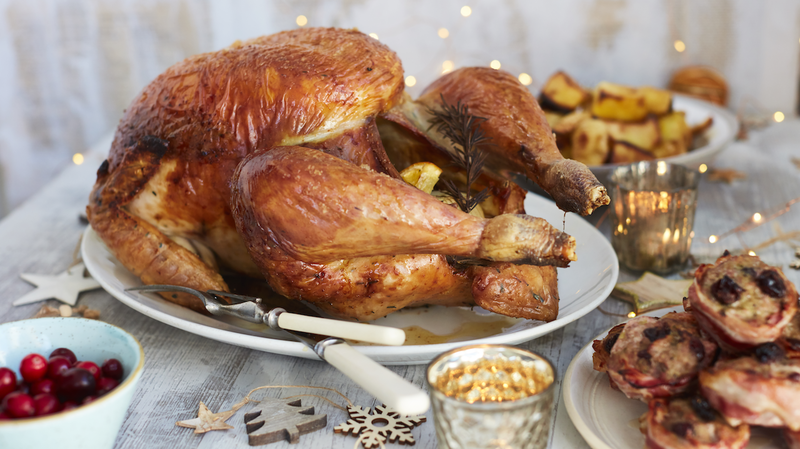 Fact number two: According to the Soil Association as many turkeys are eaten at Christmas in the UK as they are during the rest of the year put together. Fact number three: Often people tell us that they don’t really like turkey meat, but we believe that that is because they haven’t tasted it at its best. Why is it that one roast turkey has more flavour and tastes better than another? Firstly it’s not down to just one thing, as with anything we eat there are a number of factors that are likely to affect flavour and eating qualities. In the case of Turkey there are three things that affect the taste and quality of your roast. Secondly there is, of course, the way the bird is reared, that is to say how and where it is grown and what it eats. Finally, there is the matter when and how the bird is killed and stored before it finally arrives in your kitchen. Each of these elements will make the difference between a meal that is one to remember or one that is best forgotten. There are so many choices, how do I know where to start? For a delicious roast with plenty of flavour and juices for a gravy, the first thing you will need is a quality bird, please bear in mind that you may have the finest meat possible in your oven, but if you overcook it, then there is no way back. Standard indoor intensive This is the most basic and can have problems with overcrowding and poor welfare. Higher-welfare indoor These are birds grown in barns where their welfare is better managed and they can express their natural behaviours. Look for trusted logos on products, such as ‘RSPCA Approved’ or ‘Certified Humane’. Free-range This is a regulated term in the European Union, which means birds must have outdoor access for at least half of their lives and a minimum allowance of four square metres of outside space. Organic Usually organic birds have the same lifestyle as a free-range bird but are fed on 100% organic feed. How do I know I am getting a "Quality Bird"? As with any food, it all starts with the farmer and turkey farming is no different. Turkeys sold with the Golden Turkey Quality Assurance Guarantee stamp all have one thing in common and that is the concern the Accredited Farmers have for the welfare of the birds they breed and rear. The journey from the farm to the fork is strictly regulated and must be of the highest quality. Why Does Free Range Make a Difference? All free range turkeys sold with the GTA stamp live a properly free-range life, which means they live significantly longer than most other free-range and organic birds. The poults (young turkeys) hatch in late spring and spend their first few weeks under the warm lights of a brooder, here they have time to for their adult feathers to grow, these feathers will protect them once they are moved outside. 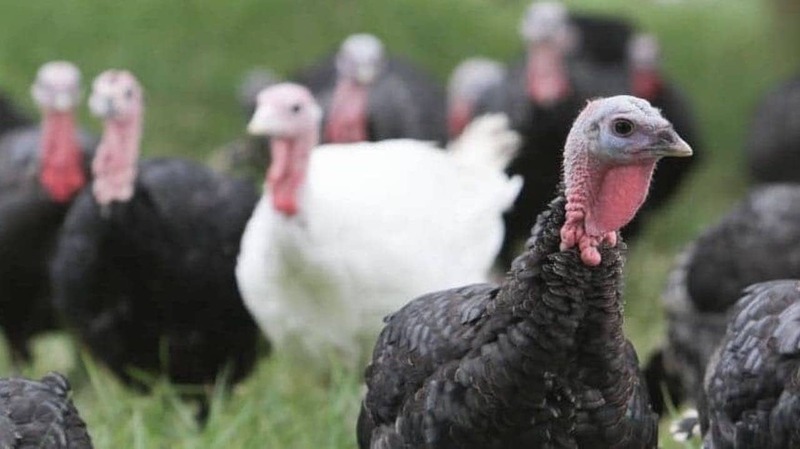 Once outside the turkeys then spend the summer roaming freely on farms, eating a natural diet of cereals, grass and depending on where they live, even cider apples. The benefit of this environment is that free-range birds tend to grow at a more natural rate which of course is much slower than their unfortunate factory cousins. Slow growth has a direct effect on flavour because their muscles contain more fat or marbling as you may have heard it referred to.and are firmer which leads to a better texture. Muscle tone is one of the reasons why free-range turkeys are less likely to dry out when you cook them. How do Golden Turkeys Differ From Supermarket Turkeys? Turkeys destined for chiller or freezer cabinet at your local supermarket are, generally speaking, not so well treated as they are bred for profit rather than their eating qualities. They live their lives in dark crowded barns and they will never see natural daylight. This unnatural environment affects how they behave, grow (a lack of proper exercise means the birds put on weight unnaturally, which is great for profit but not so good for flavour) and ultimately how the meat tastes. Rest assured this is not the case for birds bred and reared under the Golden Turkey Quality Assurance Guarantee where strict rules apply, you might go so far as to say that Golden Turkeys are the lucky ones as they are destined to live outside, get good exercise and have no end of socialising and stimulation. The lives of all turkeys reared under the Golden Turkey Quality Assurance Stamp are ended humanely as per the requirements of the EU regulations. All Golden Turkeys are dry plucked and hand finished the bird is then hung for between 7 and 14 days to develop that unique flavour for which they have become famous.